This section of the encyclopedia is for "other" Murano glass. Some of these items we have no idea about, others we might have a good idea who the maker could be, but are not 100% sure. Some we may be able to identify, but don't yet have their own section in our encyclopedia. If anyone out there can confirm the manufacturer of any of the unidentified items, please let us know, then we can move them to the relevant section of the encyclopedia. Murano glass purple + blue sculpture bowl. Murano glass blue + amber sculpture bowl. Murano glass red + amber sculpture bowl. Murano glass green + amber sculpture bowl. Murano glass green + amber sculpture bowl. Murano glass red + amber sculpture bowl, labelled. Murano glass purple + blue sculpture bowl. Murano glass green + amber sculpture bowl. Murano glass red + amber sculpture bowl. Murano glass blue sculpture bowl. Murano glass blue sculpture bowl. Murano glass green + amber sculpture. Murano glass red + amber sculpture, labelled. Murano glass red + amber sculpture. Murano glass red + amber sculpture. Murano glass blue + amber sculpture. 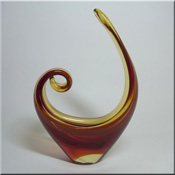 Murano glass red + amber sculpture. Murano glass green + amber sculpture. Murano glass blue + amber sculpture. 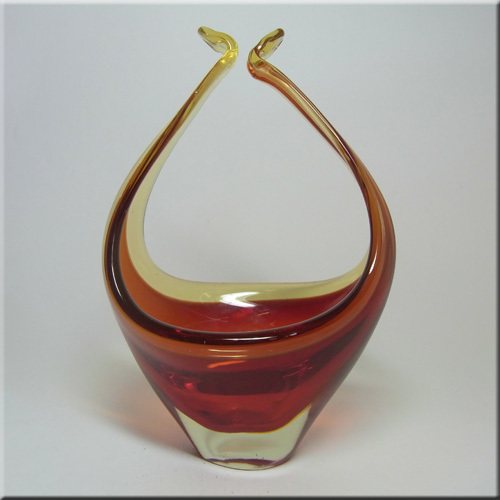 Murano glass red + amber sculpture. Murano glass blue + amber sculpture. Murano glass red + blue sculpture. Murano glass yellow + blue sculpture. Murano glass amber + blue sculpture. Murano glass blue 'Pulegoso' vase, probably by Napoleone Martinuzzi. Murano glass white 'Pulegoso' vase, probably by Napoleone Martinuzzi. Murano glass white 'Pulegoso' vase, probably by Napoleone Martinuzzi. Murano glass multicoloured 'slag glass' vase. Murano glass multicoloured 'slag glass' vase. Murano glass multicoloured 'slag glass' vase. Murano glass multicoloured 'slag glass' jug. Murano red + silver leaf biomorphic glass bowl. Murano green + silver leaf biomorphic glass bowl. Murano orange + silver leaf biomorphic glass bowl. Murano red + silver leaf biomorphic glass bowl. Murano amber + silver leaf biomorphic glass bowl. Murano red + gold leaf biomorphic glass pestle + mortar. Murano green + gold leaf biomorphic glass bowl. Murano red + silver leaf biomorphic glass bowl. Murano gold leaf glass bowl with black + green pattern, possibly by Barovier + Toso. Murano gold leaf glass bowl with orange patch. Murano gold leaf glass bowl with encased bubbles. Murano glass bowl with copper aventurine inclusions. Murano red + gold leaf biomorphic glass bowl. Murano red + gold leaf biomorphic glass bowl with encased bubbles. Murano red + gold leaf biomorphic glass bowl. Murano red + gold leaf biomorphic glass bowl. Murano red + gold leaf biomorphic glass bowl with encased bubbles. Murano red + gold leaf biomorphic glass bowl with encased bubbles. Murano yellow + green glass biomorphic bowl with copper aventurine inclusions. Murano gold leaf biomorphic glass bowl with black, red and white swirls. Murano pink + white glass biomorphic bowl with copper aventurine inclusions, possibly by Vetro Artistico Veneziano. Murano green + white glass biomorphic bowl with copper aventurine inclusions. Murano white glass biomorphic bowl with copper aventurine inclusions. Murano blue + white glass biomorphic bowl with copper aventurine inclusions, possibly by Vetro Artistico Veneziano. Murano black, white + blue glass biomorphic bowl with copper aventurine inclusions. Murano blue + white glass biomorphic bowl with copper aventurine inclusions. Murano green + white glass biomorphic bowl with silver leaf inclusions. Murano blue glass biomorphic bowl with silver leaf inclusions + encased bubbles. Murano pink + blue glass biomorphic bowl with gold leaf inclusions. Murano purple glass biomorphic bowl with gold leaf inclusions + encased bubbles. Murano pink glass biomorphic bowl with gold leaf inclusions + encased bubbles. Murano glass biomorphic bowls with silver leaf inclusions + multicoloured patches. Murano glass biomorphic bowls with silver leaf inclusions + multicoloured patches. Murano green + uranium yellow sommerso glass whale sculpture. Murano red + uranium yellow sommerso glass swan sculpture. Murano green + uranium yellow sommerso glass swan sculpture. Murano green + uranium yellow sommerso glass swan sculpture. Murano gold leaf glass bird sculpture. Murano red + uranium yellow sommerso glass dog sculpture. Murano green + uranium yellow sommerso glass dog sculpture. Murano blue sommerso glass dog sculpture. Murano pink and opaline white glass bowl. Murano red and opaline white glass bowl. Murano blue and opaline white glass biomorphic bowl. Murano blue and opaline white glass biomorphic bowl. Murano purple and opaline white glass biomorphic bowl. Murano green and opaline white glass biomorphic bowl, with controlled bubble effect known as 'Bullicante'. Murano gream and amber glass biomorphic bowl. Murano blue and opaline white glass biomorphic bowl. Murano opalescent glass biomorphic bowl with copper aventurine swirls. Murano red glass biomorphic bowl with white swirls. Murano red and opaline white glass biomorphic bowl. Murano glass white filigree 'handkerchief' vase. Italian orange textured vase, by Fontanelli or Fontanella, labelled. Multicoloured 'Millefiori' vase, probably made in Italy / Murano. Multicoloured 'Millefiori' bowl, probably made in Italy / Murano. Multicoloured 'Millefiori' bowl, probably made in Italy / Murano. Multicoloured 'Millefiori' vase, probably made in Italy / Murano. Murano glass copper aventurine bowl, possibly by Salviati. Murano glass copper aventurine plate, possibly by Salviati. Murano white + red glass clam bowl with silver leaf inclusions. Murano green + black glass clam bowl with silver leaf inclusions. Murano blue, white and amber cased glass biomorphic bowl. Murano purple, white and amber cased glass biomorphic bowl. Murano cream, white and amber cased glass biomorphic bowl. Murano blue, white and amber cased glass biomorphic bowl. Murano red, white and amber cased glass biomorphic bowl. Murano green, white and amber cased glass biomorphic bowl. Murano red, white and amber cased glass biomorphic bowl. Murano red, white and black cased glass biomorphic bowl. Murano green, white and black cased glass biomorphic bowl. Murano glass clown bowl. Murano glass clown figure. Murano glass clown figure. Murano pink and opaline white glass vase, labelled. Murano glass dolphin lamp. Murano glass dolphin lamp. Murano glass black + white filigree vase with copper aventurine. Murano glass white filigree vase with copper aventurine. Murano glass biomorphic bowl with silver leaf inclusions + multicoloured patches. Murano pink + white glass biomorphic bowl with copper aventurine inclusions, possibly by Vetro Artistico Veneziano. Murano red and uranium green glass biomorphic bowl. Murano glass black + green filigree bowl with copper aventurine. Murano glass copper aventurine tumbler, possibly by Salviati. Murano glass gold leaf bowl with pink filigree, made by Alberto Toso, labelled. Murano opalescent white lattimo + blue glass bowl with gold leaf inclusions, possibly by Fratelli Toso. Oball black Murano glass bowl with silver leaf inclusions, labelled. Oball opalescent pink Murano glass vase, labelled. Murano blue + white cased glass biomorphic bowl with red swirls. Murano red glass biomorphic bowl with gold leaf inclusions. Murano black glass biomorphic bowl with gold leaf inclusions + generic Murano glass label. Murano black + white 'Mezza Filigrana' glass jug. Murano amber cased glass shell/cornucopia bowl. Murano red cased glass shell/cornucopia bowl with gold leaf inclusions. Murano pink + blue glass sculpture bowl. Murano red, uranium green + blue sommerso glass swan sculpture with generic Murano glass label. Murano purple cased glass bowl with gold leaf inclusions. Murano cased glass bowl with gold leaf inclusions, possibly by Barovier & Toso. Murano opalescent pink biomorphic glass bowl. Murano pink glass vase with 'Scavo' finish, labelled. Murano glass orange + green filigree vase with copper aventurine.